First it will control your mind. Then it will destroy your body. 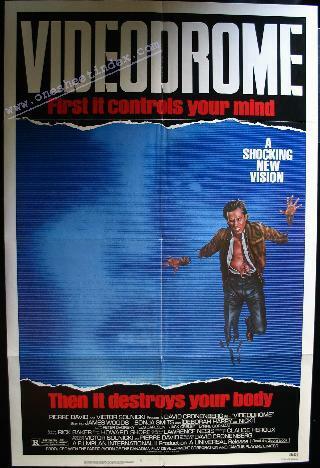 With it blend of human drama, terror and dazzling visual effects, Videodrome is a unique cinematic experience. However, the movie is more than an eerie portrayal of science fiction or horror. In fact, it fits neither of these categories. It is appropriately strange and ominous, while maintaining a solid base in social reality. Pierre David and Victor Solnicki present a David Cronenberg Film, Videodrome starring James Woods, Sonja Smits and Deborah Harry as Nicki. A Universal Release, it also stars Peter Dvorsky, Les Carlson, Jack Creley and Lynne Gorman. A Filmplan International II Production, it was written and directed by David Cronenberg, and produced by Claude Heroux. Victor Solnicki and Pierre David were executive producers. It was produced with the participation of Famous Players Limited and the Canadian Film Development Corporation. has become a cult figure among devotees 0± the bizarre, and box office receipts testify to his popularity. Upcoming is "Dead Zone," from Stephen King's bestseller. Despite the eerie and foreboding subjects of his films, Cronenberg is a low-key individual. His gentleness does not betray his potential for displaying works of such a convoluted imagination. "My childhood was unusually nice, I think. I had a very close family," he says, "one that was relatively calm in terms of personalities. And my parents were generally supportive of anything I did." Born in Toronto, Canada, Cronenberg grew up there as a teenager. "It was the Eisenhower era. Everything was neat and clean-cut. Nothing nasty, no undercurrents. In retrospect, that's enough to make you want to be extreme in order to break through that surface, no matter how nice your family might be." The main character in Videodrome Max Renn (played by James Woods), runs a cable-TV station and has his motives questioned because he shows extreme material. "There are obvious parallels between me and Max," acknowledges Cronenberg. "But he's not really me, although the similarities open up questions. The movie goes into more than the relatively simple issue of morality, like the ways in which television does alter us physically. It's what Marshall McLuhan was talking about -TV as an extension of our nervous systems and our senses." Because Cronenberg is perhaps best known for the exploding heads in "Scanners," any mention of "altering" in his movies conjures up images of very bizarre occurrences. Videodrome lives up to expectations, but Cronenberg is quick to point out that, no matter how critical special effects are to the movie, they are absolutely not what it is about. In fact, he says, "I deliberately de-emphasized those elements. It's got a very seedy look to it, not high-tech at all. It's not an action picture, like 'Scanners.' Like 'The Brood,' it's a character study in the horror genre, although it does take a couple of extreme turns." For Cronenberg, those turns are a form of confrontation, and that, he feels, is the basis of horror stories. "A lot of people think of film, in general, as an escape," he comments, "an escape to entertainment. But I think of horror films as art, as films of confrontation. I think of them as films that make you confront aspects of your own life that are difficult to face. In that way, horror's just like any other serious genre."